Newcomers to Mason are surprised to find an older downtown with architecture from the 1950s. The spotless downtown represents the old Mason... [it] has become the second-fastest-growing locale in Ohio. Welcome to Mason, Cincy magazine's No. 1 suburb for 2009. 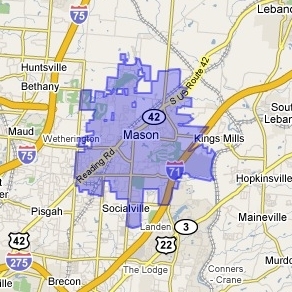 The 2007 American Community Survey conducted by the U.S. Census ranks Mason as the second most family friendly city in the area.